Sorry out of stock. Please check back soon. Features a top-feed hydroponic system hidden inside a wooden planter that delivers water and nutrients directly to the roots of three separate plants on a pre-programmed feeding schedule. This self-sustaining system is the ultimate container gardening solution, and is designed to fit on a sunny windowsill. Grow a wide variety of edibles year round, from herbs and leafy greens to fruiting plants like peppers and tomatoes. Start from seed, cutting or transplant. Below is a sampling of suggestions. For more information, visit our Growing Guide BEGINNER Kale, Basil, Mint Lettuce, Arugula & Chives INTERMEDIATE warm weather (water-loving): Oregano, Parsley & Cilantro warm weather (dry-loving): Lavender, Rosemary & Sage cool weather: Spinach, Peas & Swiss Chard ADVANCED Cherry Tomatoes, Hot Peppers & Cucumbers Lettuce, kale, & other green leafy vegetables Year-round Basil, mint, & other water-loving herbs Year-round Geranium, snapdragon, trailing vinca, & other flowers Fall through spring Cucumbers (direct sun in a south or west-facing window) Late winter through fall Cherry tomatoes (direct sun in a south or west-facing window) Late winter through fall. To get started you need nutrients, light and either seeds/cuttings/plants. Nutrients: There are two basic nutrient formulas to consider when feeding your plants, and both include Nitrogen (N), Phosphorous (P), and Potassium (K). The first formula is geared towards vegetative growth (stems and leaves), and has a higher ratio of nitrogen (e.g. N-P-K value around 3-2-4). The second formula encourages fruiting and flowering, and requires less nitrogen and more potassium (e.g. N-P-K value around 2-3-5). More info below in the “What nutrient products do you recommend” line item. Light: Lighting needs vary depending on plant type, but most will prefer an unobstructed south, west or east window with direct light. During winter months—or if you don’t receive direct light or have a north-facing window—you can supplement with a grow light. More info below in the “How much light do I need” line item. Seeds/Cuttings/Plants: Seeds will need to be started in a seed starter cube (included with our seed starter kit). Cuttings are taken from another plant, and should be dipped in a rooting hormone then placed in a seed starter cube. Specific plants transplant really well, including basil and rosemary, and just need to have 70% of the soil rinsed off of their roots. Additional information is included in the instruction manual that ships with the planter. Hydroponics is a system for growing with a solution of water and nutrients in a soilless medium. In a top-fed active hydroponic system, a pump moves the water and nutrient solution from a reservoir up to plant roots, where the roots take what they need and the rest recycles back into the reservoir. Hydroponics offers a method of cultivation that’s clean, sustainable and yields fantastic results. Plants thrive because they get fed when they need it, where they need it. When compared to soil gardening, hydroponics uses an estimated 80% less water, grows plants 30% faster, and occupies ¼ of the space. When a planter is labeled “self-watering” it most likely utilizes passive hydroponics (like our Garden Jars). 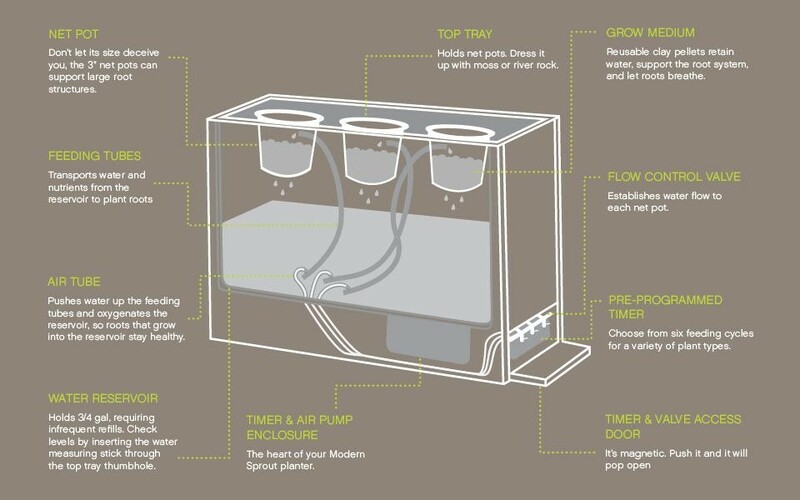 Passive hydroponic planters feature a wicking system with soil or soilless grow medium. Passive hydroponic planters don’t grow plants as quickly as active, and have a slightly more limited selection of plants that will thrive. What nutrient product do you recommend? We recommend using organic liquid nutrients, which are a mix of kelp (seaweed) and other natural products, and can be found online or at hydroponic stores and boutique garden centers. Our current favorite is Botanicare Pure Blend Pro Grow for vegetation and Botanicare Pure Blend Pro Bloom for flowers for fruiting. We are one of the few online retailers that offer Botanicare’s Pure Blend Pro in pint-sized containers. Substantial light and proper temperatures are crucial for fast growth, healthy plants, and high yields. Your planter should be placed in a well lit location—unobstructed south or west-facing windows will produce the best results. Most leafy greens want at least 4-6hrs of direct light, while flowering and fruiting plants want 10-12hrs. Even with limited light you have plant options, including chives, lemon balm, mint, sage, shiso, lettuce, arugula, kale, Swiss chard, spinach, peas and a variety of houseplants. The optimal temperature for most plants is 65⁰-75⁰F. Supplemental light—especially during winter months—enables year-round indoor growing and fills the gaps during dark days. Herbs and leafy greens will benefit from fluorescent light bulbs (tubes or CFLs). LED grow lights are becoming more popular and efficient, and are available in two color spectrums—blue and red. Blue wavelengths are ideal for the vegetation and red wavelengths are designed for the flowering and fruiting stages. H.I.D. (High Intensity Discharge) grow lights, such as Metal Halide and High Pressure Sodium, are common in commercial indoor growing.